Fortrose and Rosemarkie Community Council | Summer Holiday Activities: Available to view online now! Highlife Highland have published their schedule of Summer activities as they say "The school holidays are fast approaching, which means it’s time to start planning some fun activities for the family. 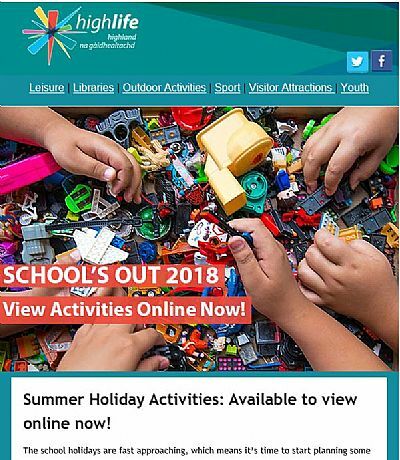 Our School's Out catalogue is now available to view online and we've got an exciting range of activities available in 2018. From swimming lessons to Bookbug, mountain biking to crafting challenge days – you’ll find a host of activities on offer across the Highlands to exercise, inspire and entertain."